Florian Cafe: Poetry Friday: Starred Review! Its back limbs were strong. Its front limbs were small. 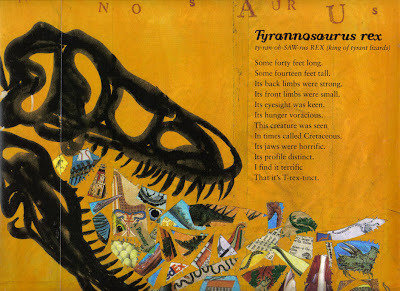 My great editor, Andrea, just told me that Dinothesaurus is getting a starred review in Publishers Weekly. Yay! This is a great one! I love the illustration too. I can't wait for this book to be published. I've already pre-ordered two copies. Congratulations! A whole galaxy of stars for you. Love it! My son will so enjoy this, he wants to go to the Field Museum to see the dinosaur bones and this is a must read before or after that trip! Congrats on the great review, Douglas! Yay for the starred review! Heartiest congratulations on the PW star, Douglas! Excellent review! I love your puns. Thank you Poetikat, Nanny, Elaine, melanie, Kelly, Yat-Yee, Pat, Jama, Poetikat again, and Julie! Congratulations on the star! Fabulous! This one will have to go in our "own it home" collection, as we are all Florian fans as well as Dino-lovers. Thanks for the link, Jill. Also thanks to Cat (such a cool jumping icon!! ), Laura, and Rrrrrrrrrrraffy. I just won this book in a contest on Kelly Polark's blog. It came today and I reviewed it for POETRY FRIDAY on my blog (www.carolwscorner.blogspot.com) tonight! It deserves five stars. It's terrific!